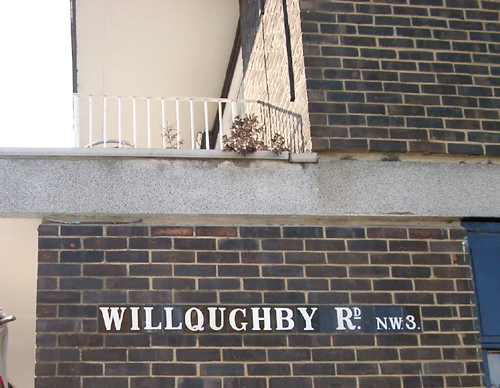 In Hampstead there are at least two roads where the sign-fitters ran out of letters for the mosaic-tiled strret name plates, and were forced to re-use the design's constituent elements to get the job done: on WILLQUGHBY Rd. NW3 (map), a Q is pressed into service as an O. 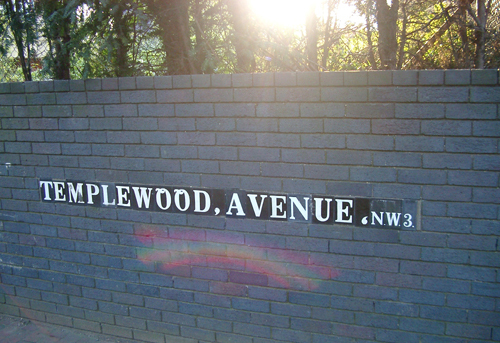 And by the time they got to TEMPLEWQQD,AVENUE,NW3 (map), they'd run out of spaces as well (substituting in the comma tiles), but had started making design decisions: the Q tile standing in for an O will read better if it's placed upside down. London Transport Users' Committee's Where Am I? 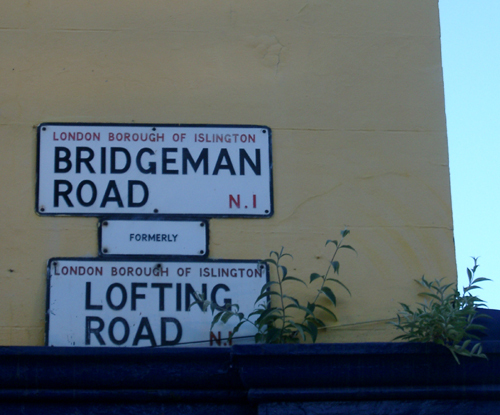 Street name signs in London (PDF, 2003) - this interesting report points onward to New York's signage regulations, a website on street signage globally (it's like a Franco-South-American version of Jack's Public Lettering), and the Sign Design Society (website looks a bit fallow). update: more street, road and other public signs in Phil Baines's and Catherine Dixon's excellent Signs: Lettering in the Environment book. You'll want this on your shelf. What a coincidence - but an hour before reading this I was walking through London Fields and noticed a similar "recording own history" set of signs for the first time: "MARTELLO ST / FORMERLY / xxxx ST" (I forget what name it formerly was unfortunately). I find it fascinating that you have found all this out - did you do it yourself ? I have a Sat Nav in my car, and it thinks that Ashley Crescent is Wickersley Road, and I think it may have a point, because the whole road would have at one point been Wickersley before they built the housing estate Ashley, and decided presumably to rename that part. Does that count for anything ? Hi,I'm a journalist for BBC London and have found your site interesting. 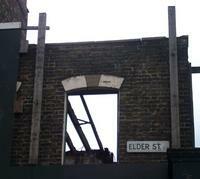 I came across it researching an idea to uncover some of the stories behind London's street signs. I'm aware that many signs, for example, are named after local people or events. I'd be interested in you thoughts. Have you done something similar? I came across your site the other day and found it really interesting but what I didn't expect was to see one of the signs you pointed out (Willqughby Road in Hamsptead) whilst travelling on a bus yesterday. Very random that I saw the sign on your site and then the same night I go out on a bus, on a route I've never been on before, and just by chance it happens to go past the end of Willqughby Road, NW3! My daughter is getting married in June 2005 and wants various London street signs, which are of sentimental importance as table signs at the reception. Can anyone help me find an art source for these, or a template I could use to create these 'table' signs in the authentic and correct format. I have an enamelled london EC1 street sign, is there anyone who deals in such signs if can they please contact. Thanks, John. Hi there, I am a 4th year student at the University of Reading studying 'Typography: Design for Communication'. I'm currently researching for my dissertation title "The social, historical and practical uses and influences of English street-name sign design. " This website has pointed me in some great directions already and i'm very grateful! If anyone has any extra information they would be able to give me then it would be much appreciated. This is all really good stuff. 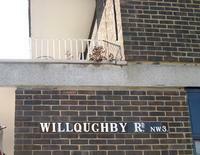 I especially love the NW3 road names. 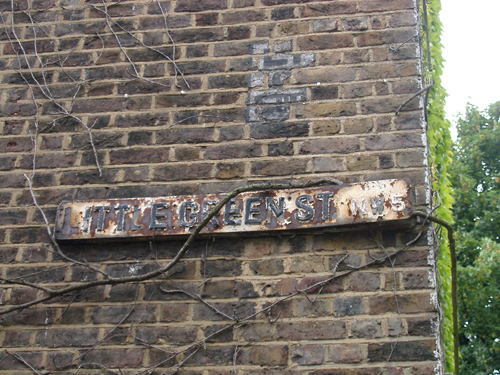 I came across your site trying to find out the dates when street names stopped being hand-painted and became metal/enamel signs. I have quite a collection of photos showing various ones including some for streets that don't exist at all any more, ones where the street has been re-named and others in the Lower Clapton area showing the now defunct NE postal area. i think you will find them interesting. Re the wonderful gold street name on the building in Gower St; the whole building is covered in wonderful motifs and well worth a closer look. 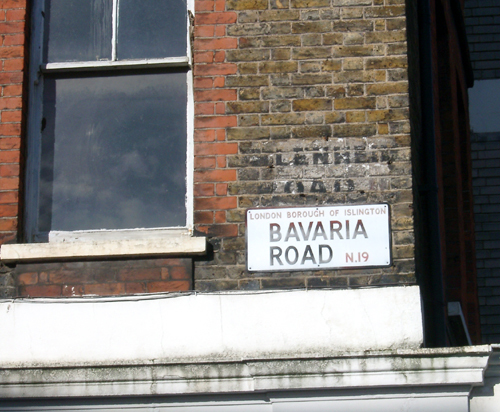 And above the sign for Bavaria/Blenheim road is a sign for the coffee house that used to be there. Amazing! 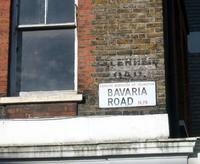 Hi, I would be interested to know if any of you guys no the fonts used by THe Royal Borough of Kensington & Chelsea for their street name signs? They use a black type for the strret name & red gothic like typeface for their Borough name. ANy help would be most appreciated. 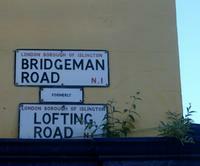 What is the font for the Bridgeman Road/ Lofting Road sign?...Cool stripe pattern in margins by the way. Where did you source them? if you attach a ref/link to an an image of one of the signs I will attempt to identify the typeface. 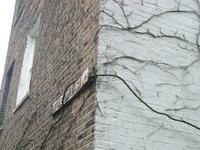 There is a book available called Kensington and Chelsea Street Names: A Guide to Their Meanings (Paperback) by B.R. Curle that might be helpful; I found it on Amazon. Thanks Paige, I have some pics of some of teh road name plates but don't know how to load them onto this message! 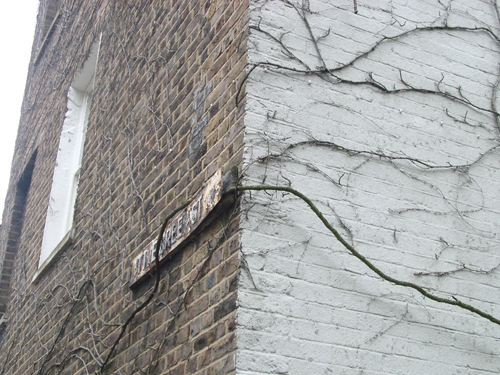 Help, I'm making a model & I need to know what the London (I came from there but now live in Australia)street signs were post war & before 1968 when they unneccesarily changed them.